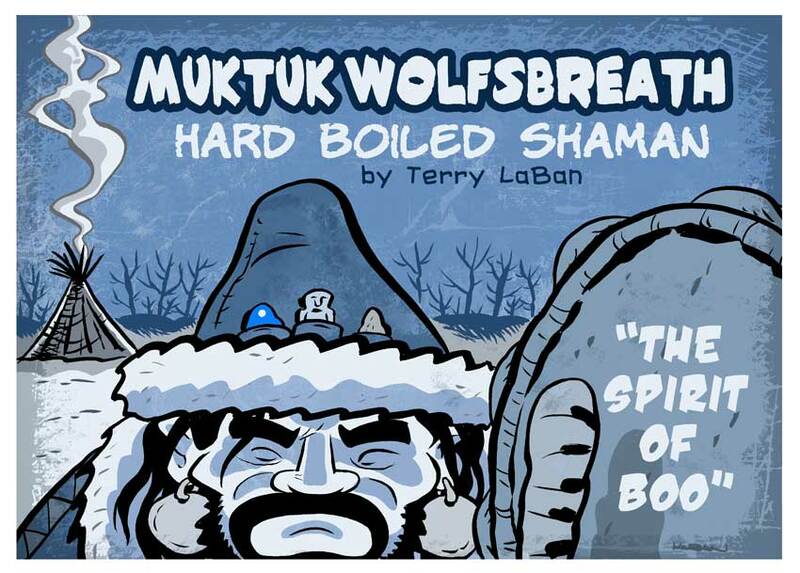 Muktuk Wolfsbreath: Hard Boiled Shaman is an online comic I started following a couple of years ago. I can't recall how I found it. Probably linked through some comic news site I visit. I read a couple of the daily strips and found it entertaining. I wasn't very good at keeping up with a daily strip though. I didn't visit the site for months, and by the time I did, the strips were no longer available there. 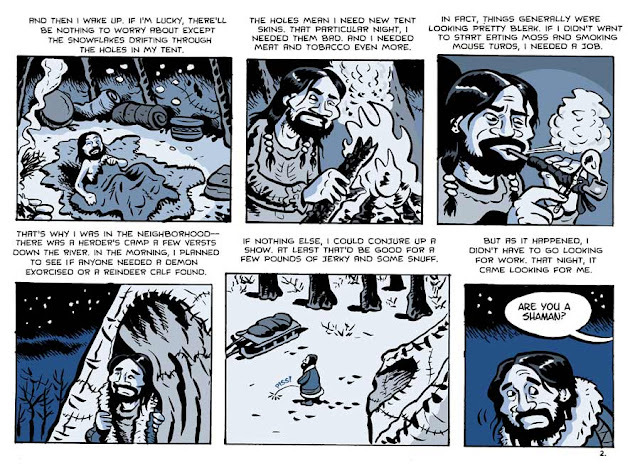 I was happy to learn, however, that the author, Terry LaBan, published his strip in book form. Wanting to support the author, I ordered a copy through Amazon. I recently read the entire story and enjoyed it in its entirety. 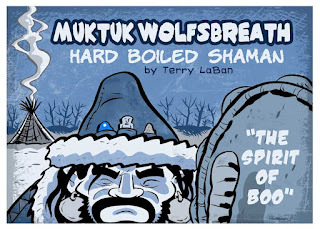 It's titled “The Spirit of Boo”, and it involves our eponymous Siberian shaman and his efforts to save a young boy who's fallen desperately ill. In his otherworldly travels, Muktuk discovers that a rival shaman is attempting to claim the boy's soul due to a debt owed by his clan. As the title suggests, the story mashes up shamanism with a story right out of your average noir detective film. There's a femme fatale, the initial mystery of the boy's illness, and the mistrust Muktuk encounters despite his good intentions. I'm not normally a fan of this stunt, and the world of comics is unfortunately enamored of it all too often. Think of the movie Cowboys and Aliens, based off of a graphic novel. The very idea conjured by the title just doesn't appeal to me. LaBan's story succeeds though. Although a case could be made that there's a noir overlay to the proceedings, I could believe Siberian natives acting in the way that they did, even without that conceit. Muktuk has to make tough choices, one of which results in the death of a close animal friend. The dialogue is suitably sparse, and in spite of the presence of talking animals, there's no Disney effect. A boy's life hangs in the balance, and the story never forgets it. The art is somewhat cartoony, but not so much that it detracts from the subject matter. The one weakness I found was LaBan's depiction of the demons. It's extremely rudimentary, a style which I feel I could copy almost exactly, and I'm no great artist by any means. It's a minor flaw, in the end. As a bonus, the author includes older stories that were serialized in DC's Vertigo imprint back in the mid-90s. The stories are fairly short and lightweight, and the art is more detailed, very reminiscent, in fact, of R Crumb. They show how far LaBan has brought the character in nearly 20 years. He hints at possibly more Muktuk stories to come. If you're looking for a graphic novel that isn't superheroes, and which boasts a very unusual setting with good writing, this is definitely worth a look.